Pete Seeger, who has died at the age of 94, was a great folk singer and activist. He sang folk songs: people’s songs from around the world, workers’ songs, songs for the struggle. He wrote some great songs of his own, but over the many decades of his life he was also perhaps the greatest populariser of songs like this one: Which Side Are You On, written by Florence Reece, the wife of Kentucky miners’ union organiser Sam Reece, in 1931. Music with a message: Pete’s banjo. I can’t do justice in a quick post here to Pete Seeger’s very long life — he was an antifascist, an anti-racist, a one-time Communist Party member who refused to name names to the McCarthy witch-hunters and was blacklisted but was later prepared to admit he was wrong about Stalin, a campaigner against war and for the environment, and a man who was never scared to take sides. I’ve got several versions of Which Side Are You On. At a hard time of life a few years ago, I put all of them on my ipod and played them all repeatedly to keep my head together. But Pete Seeger’s version was the one I heard first, like so many others before me. That was the one whose words I learned, the one that you can hear the whole audience singing along to, on the video above. I heard it as a child and it always stayed with me, a simple song and a statement of principle. It’s always given me goosebumps. Last time I heard the song was in Greece in September. Key leaders of the fascist Golden Dawn party had just been arrested and there was a mood of elation and celebration in the air. On the beach on a small island, I sat with friends as we listened to news bulletins on the radio, interrupted every five minutes or so by songs: Tracy Chapman’s Talkin’ ‘Bout a Revolution, Rage Against the Machine, that kind of thing. This was “workers’ radio”, from the national broadcaster ERT that had been occupied by its staff, and the music provided their commentary on the news of the day. One of the songs was Which Side Are You On — not Pete’s version but the lovely, haunting track recorded by Natalie Merchant. Pete Seeger had been around so long that it feels like he has given us everyone else’s versions of the song — with the lyrics often adapted to reflect this struggle or that — as well as his own recordings. 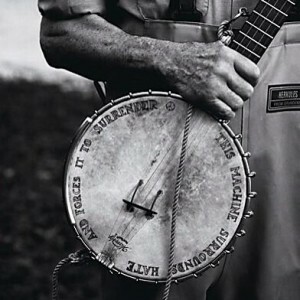 RIP Pete Seeger. Thanks for the music and for being on our side.